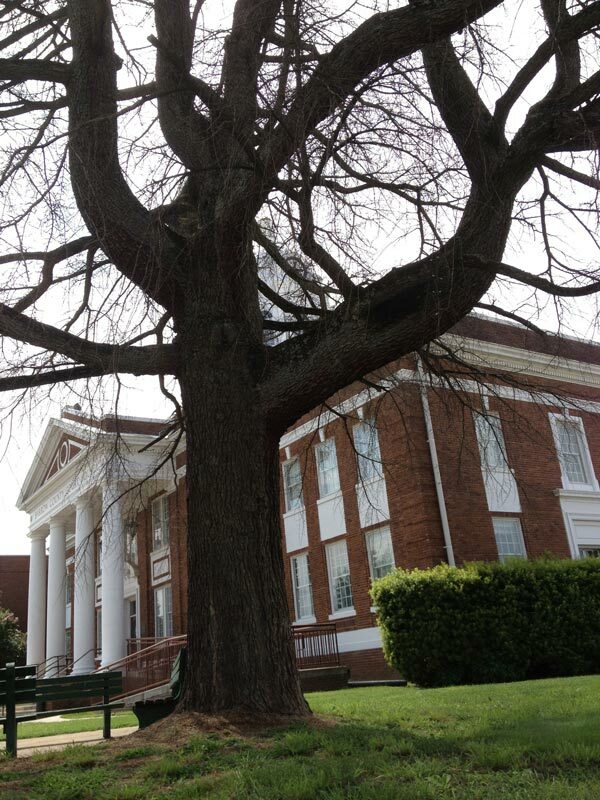 Several weeks ago a huge Deodor Cedar tree was cut down from in front of the Barrow County courthouse in Winder, GA. 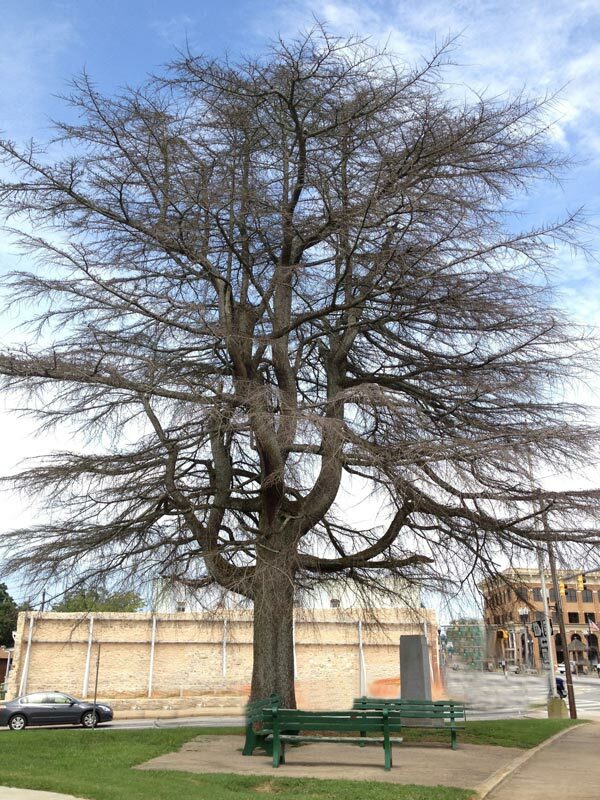 This tree, which had recently died, was approximately 70 years old - having been planted just after the erection of the courthouse for the young county of Barrow, established in 1914. Many residents of the county have fond memories of the tree and of the elders of the town playing checkers in the ample shade offered by its branches. Instead of having the remains of the tree chipped up and disposed of, a group of citizens rescued the wood and are offering it to artisans who will promise to make one or more items for show or sale at the upcoming Barrow County Centennial Celebration in 2014. Planning is just beginning for the celebration in 2014. I've been contacted by a the tree's rescuers and asked to help broadcast this great opportunity to local woodworkers interested in participating in the project by creating beautiful mementos from the wood from this huge tree. There are no specifics on the mementos so every woodworker has an opportunity to let their creative juices flow. Make whatever you want - large or small, affordable or expensive. All woodworkers are invited to participate - general woodworkers, woodturners, scroll sawyers, woodcarvers, chainsaw carvers, etc. The main goal is to have items for show and sale at the centennial celebration. Artisans are expected to get the biggest cut of proceeds from sales of their items. A small percentage will go to cover expenses incurred in saving the tree and moving the pieces and possibly other expenses not yet incurred or anticipated. The main trunk is in two pieces approximately 8 feet and 12 feet in length. Diameter varies from approximately 3 feet to 4 feet (just estimated, not actually measured). There are also several main limbs which are 2 feet to 3 feet in diameter and varying in length. All the limbs and twigs were saved even down to some stuff about 1 inch in diameter.... anybody know how to make wooden beads or baskets? The remnants of this grand tree are available now. They are not sheltered, so even though deodor cedar is a weather resistant wood you need to make haste to Winder to get pieces you would like to use to make and sell some mementos for the Barrow County Centennial Celebration. 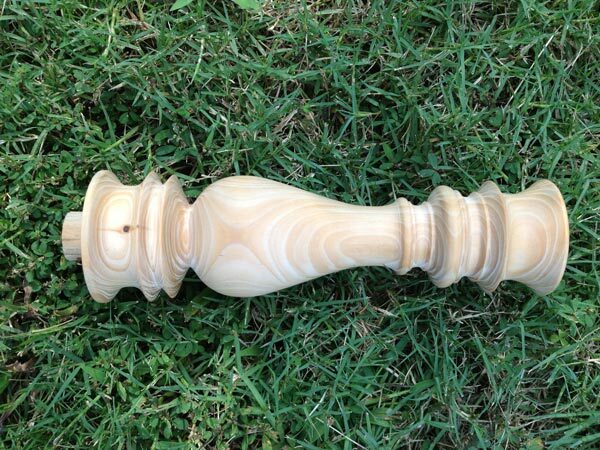 Members of the Classic City Woodturners in Athens and many other artisans have already picked up some of the wood. The wood from this great tree is available free for the taking. All they ask is a promise to have one or more pieces used to make mementos for sale at or donated to the Centennial Celebration. If you would like to pick up pieces of the tree, please contact Jane Grider at 770 867-9083 (home) or 770 295-9972 (cell) for more information. The county will soon be appointing a committee responsible for planning the Centennial Celebration. We anticipate that in addition to the display of items made from the Deodor Cedar, free display space will be provided to promote the woodworking skills of participating woodworkers... a grand celebration of the wonders of wood. This will be a great opportunity for exposure in showing and selling your work and showcasing your skills by presenting the mementos made from this deodor cedar tree. This celebration seems a long way off. But, you know how time flies by. And the wood from this special tree will only be available for a short time. So if you think you might participate please don't delay. You or a designated representative from your woodworking club should see about picking up pieces of the tree at your earliest convenience.